Julian Arato was an IILJ Scholar from 2008-2012. After receiving his J.D. and L.L.M. from NYU Law in 2012, he went on to receive his J.S.D. from Columbia Law School in 2016. He is currently an Assistant Professor of Law at Brooklyn Law School. He previously worked as an associate in the international arbitration group at Freshfields Bruckhaus Deringer, where his practice focused on international investment disputes and international commercial arbitration. 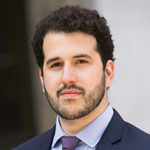 Julian Arato’s research and teaching interests include international economic law, public international law, international organizations, contracts, and private law theory. He has written extensively on the law of treaties and treaty interpretation, the law of international organizations, and the law of foreign direct investment. He is currently working on a long-term project on the private law dimensions of international investment law. At Brooklyn Law School, he serves as Assistant Director for the Dennis J. Block Center for the Study of International Business Law. He also serves as a Co-Chair of the Junior International Law Scholars Association (JILSA); as Vice Chair for the American Society of International Law (ASIL) International Economic Law Interest Group; and as a member of the International Law Association Study Group on the Content and Evolution of the Rules of Interpretation.